A group of Rice seniors will be hosting a dodgeball tournament to raise money for the Vermont Children's Hospital. The event is open to all Rice students, family members and alumni, ages 12 and older. 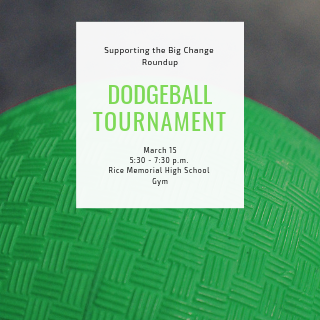 Play against classmates, parents, kids, and teachers for a chance to win a $15 Chipotle or Starbucks gift card for each member of the winning team. There will also be prizes for best team uniform and most team spirit! A concessions stand will also be set up, which will include a raffle. Learn more about the event here. All proceeds go towards the Big Change Roundup which supports the Vermont Children's Hospital, keeping kids in our community healthy and happy.